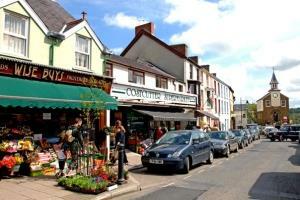 Narberth TownNarberth is a gorgeous little market town in the east of Pembrokeshire. Multi coloured Edwardian and Georgian buildings line the high street which has developed quite a reputation as a shopper’s heaven. Independent shops selling a whole range of exquisite items from fine art to fine food rub shoulders with vintage and antique shops. Then when a well earned rest is needed, there are award winning cafes, pubs and restaurants galore to rest your weary feet. Narberth also benefits from the events held at the Queens Hall, which is undoubtedly the premier music venue in Pembrokeshire. The town's museum houses some fascinating exhibits, whilst Narberth Castle and Llawhaden Castle are perfect for anyone wanting to delve a little deeper into Pembrokeshire history. Narberth holds a series of annual events that are not to be missed including Civic Week, Narberth Carnival and a Food Festival. ; Oakwood Theme Park is nearby. Narberth has a railway station on the Carmarthen and Whitland line to Tenby and Pembroke Dock. Narberth (Welsh: Arberth) was founded around a Welsh court, but later became a Norman stronghold on the Landsker Line. It became the headquarters of the hundred of Narberth and was once a marcher borough. The town plays a high-profile role in Welsh mythology, where it is the chief palace of Pwyll, Prince of Dyfed, and a key setting in both the first and third branches of the Mabinogi. One of the most popular areas of Narberth's Museum for young families is the Mabinogion woodland glade. As well as explaining the story of the Mabinogion through interpretive panels it includes a storytelling chair where children can listen to Welsh folk stories in English and Welsh. Narberth is a gorgeous little market town in the east of Pembrokeshire. Multi coloured Edwardian and Georgian buildings line the high street which has developed quite a reputation as a shopper’s heaven. Independent shops selling a whole range of exquisite items from fine art to fine food rub shoulders with vintage and antique shops. Then when a well earned rest is needed, there are award winning cafes, pubs and restaurants galore to rest your weary feet. Narberth is easy to reach by car along the A40 from the end of the M4. Turn left at the Penblwyn roundabout where Narberth is one mile south with easy access and plenty of parking. Locally the Greenways scheme encourages people to come to Narberth by bicycle as this is so beneficial for the environment.